WASHINGTON, D.C. -- The National Council for Behavioral Health is pleased to announce the five pilot organizations chosen for CONNECTED, a two-year initiative designed to reduce anxiety, depression and suicide among young people aged 10 to 24 in underserved communities. Catholic Charities Archdiocese of New Orleans – New Orleans, La. Mental Health Task Force of Washburn County – Spooner, Wisc. Whatcom Family & Community Network – Bellingham, Wash. 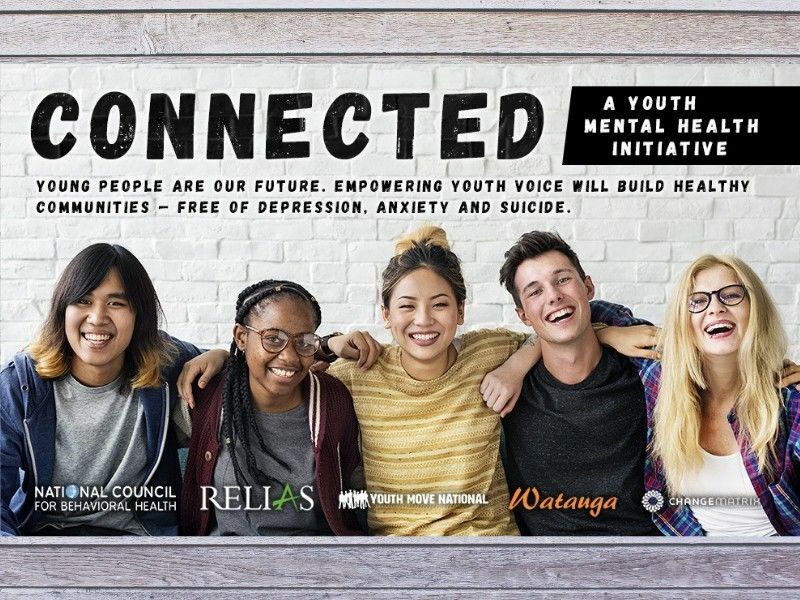 CONNECTED will address issues of growing concern, including access to quality mental health care and engaging culturally diverse, rural, LGBTQ+ and other underserved youth populations. Over the next 24 months the organizations will work to identify new community approaches for these young people. Recognizing that approaches are most effective when developed and implemented at the community level with involvement from those they intend to serve, CONNECTED will engage 20 youth influencers who, under the guidance of coaches and experts, will work to increase engagement and sustain services for young people in their communities. The National Council has partnered with Change Matrix, Relias, Watauga Consulting and Youth MOVE National to achieve the goals of CONNECTED. A project evaluation, led by the Michigan Public Health Institute, will study the factors that contribute to successful implementation and replication of effective approaches. Following the pilot and evaluation, lessons learned and resources will be shared nationally. The National Council for Behavioral Health is the unifying voice of America’s health care organizations that deliver mental health and addictions treatment and services. Together with our 2,900 member organizations serving over 10 million adults, children and families living with mental illnesses and addictions, the National Council is committed to all Americans having access to comprehensive, high-quality care that affords every opportunity for recovery. The National Council introduced Mental Health First Aid USA and more than 1.5 million Americans have been trained.